I thought I would take a break from my series on the American Revolution to share the latest entry I have made in my commonplace book. It comes from a book I listened to just a couple of weekends ago as I made the 640-mile-drive from Wheaton to my father’s assisted living home in southeastern Tennessee. I make the trip almost every time the school’s schedule permits. In this case, Wheaton College was on what is known euphemistically around here as “Spring Break.” If the term describes reality in some parts of the country, I’ve learned that it’s mostly a cruel joke in the upper Midwest. There were icicles on the eaves and six inches of snow on the ground as I backed out of my driveway, and I was happy to be headed for warmer climes. I was also looking forward to listening to an audio book or two along the way. Nothing makes the miles pass as quickly, in my experience. I’ve made this trek more than thirty times since moving to Wheaton, and I’ve long since developed a ritual in which I visit the local library on the day before the trip and check out three or four titles. I’ll listen to the opening pages of each as I’m headed out of town, and before an hour has passed I’ve made my choice and entered into a committed relationship for the duration of the trip. The choice was easy this time around. 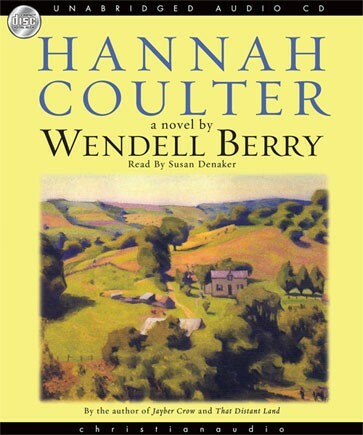 I settled quickly on the 2004 novel Hannah Coulter, by Wendell Berry. 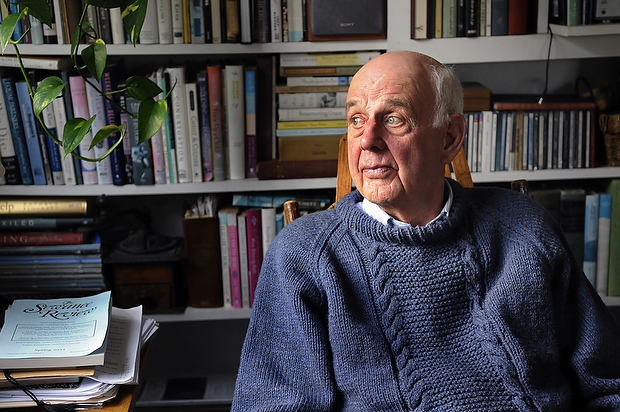 I had long heard of Berry, the prolific Kentucky novelist, poet, and essayist, but I had never read anything by him until the previous fall, when I had listened to his 2000 novel Jayber Crow on an earlier trip to see Dad. I’m a historian—not a literary critic—so take this assessment for what it’s worth, but I was enthralled. I think the book is remarkable in three respects: Berry masterfully recreates a place, in this instance the fictional rural community of Port William, Kentucky; he raises eternal questions without preaching or offering simplistic answers; and he crafts what is hands down the most unique love story I’ve ever encountered. Call me a fan. And so when I found that the library carried another Berry title on tape, I knew that I wanted to listen to it. Like Jayber Crow (and most of Berry’s fiction), Hannah Coulter is set in the tiny hamlet of Port William. Whereas Jayber Crow recreated life there through the eyes of the town’s barber, Hannah Coulter sketches the community through the memories of an aged farm wife. Chronologically, the novel spans the period from the Great Depression through the close of the twentieth century, but the emotional heart of the novel grapples with the personal effects of the Second World War. Toward the end of her recollections, Hannah relates that she “married the war twice, you might say, once in ignorance, once in knowledge.” She married her first true love, Virgil Feltner, just weeks before the Japanese attack on Pearl Harbor. Virgil entered the army in 1942 but didn’t come home, falling at the Battle of the Bulge. In 1948 she married another local GI, Nathan Coulter, who did come home but was forever marked by what he had experienced. Some of the passages that I have recorded in my commonplace book are there for personal reasons. Hannah’s reflections about her second husband remind me of my own father’s unwillingness—or inability—to share about his wartime experiences. As I have noted before, my dad served in the navy during WWII and saw extensive action in the South Pacific. On the third anniversary of Pearl Harbor, his destroyer, the U.S.S. Mahan, was hit by three Japanese Kamikaze suicide bombers off the coast of the Philippines and sunk. Dad has always been willing to share this much, but no more. What he felt when he heard the crash of the Kamikazes, what he thought when the forward magazine on the Mahan exploded, what he saw as he headed toward the side, what went through his mind when he jumped into the oil-coated bay, what, perhaps, he prayed as he bobbed in the water while the battle continued to rage—these are things that Dad never once offered to share. He did not talk about it, I understood, because it was painful to remember; and for the same reason I did not ask him about it. . . . Nathan was not the only one who was in it, who survived it and came home from it and did not talk about it. There were several from Port William who went and fought and came home and lived to be old men here, whose memories contained in silence the farthest distances of the world, terrible sights, terrible sufferings. Some of them were heroes. And they said not a word. They stood among us like monuments without inscriptions. They said nothing or said little because we have barely a language for what they knew, and they could not bear the pain of talking of their knowledge in even so poor a language as we have. Grieved as I was, half destroyed as I sometimes felt myself to be, I didn’t get mad about Virgil’s death. Who was there to get mad at? It would be like getting mad at the world, or at God. What made me mad, and still does, were the people who took it on themselves to speak for him after he was dead. I dislike for the dead to be made to agree with whatever some powerful living person wants to say. Was Virgil a hero? In his dying was he willing to die, or glad to sacrifice his life? Is the life and freedom of the living a satisfactory payment to the dead in war for their dying? Would Virgil think so? I have imagined that he would. But I don’t know. Who can speak for the dead? . . .
No context, no meaning. Know context, know meaning. In my last post, I explained that if we want to understand the causes and meaning of the Revolution to American colonists, we need to place the events that get into the textbooks—the Boston Massacre, the Tea Party, the shots fired on Lexington Green—into the larger fabric of their lives. This will necessarily involve figuring out what was going on in their lives at the same time as the highly publicized political events that we tend to remember. But we will also need to investigate what has gone on before those events—maybe even long before them. Both dimensions of context are essential. But context is not something you simply uncover in the archives. When historians speak of historical context, they don’t simply mean “other things going on at the same time or earlier.” They have in mind details that have explanatory power—events or patterns or beliefs that help us to understand our subject more fully. As educational psychologist Sam Wineburg reminds us, the word context is derived from the Latin contexere, “to weave together.” Determining the context of a key historical event like the American Revolution requires that we “engage in an active process of connecting things in a pattern.” Historians will not always agree on what contextual details are important. You and I may not either. When it comes to the American Revolution, certain contextual details are undeniably crucial. Academic historians agree that it is impossible to understand the beginning of the American Revolutionary War without taking into consideration the way that the relationship between England and her North American colonies was changed by the repercussions of the French and Indian (or Seven Years’) War that ended in 1763. There’s no avoiding the familiar back-and-forth of Parliamentary policies and colonial protests between 1763 and 1776, and we’ll get to that, eventually. But first I wanted to spend half a week or so discussing the labor systems of colonial America. To get their attention, I told them that I didn’t think it would be possible to understand the larger meaning of the American Revolution without wrestling with the prevalence of slavery and indentured servitude to the colonial world. Can I say this dogmatically? No. Remember, I am learning about the American Revolution along with my students. But is there good reason to think this might be true? Absolutely, and the reason is simple: as the struggle with Great Britain unfolded, the colonists over and over and over again referred to slavery in describing what was happening. To hear them tell it, King George III had determined to make them slaves. If they meekly submitted to his yoke, they would be behaving like slaves. In slavery, the colonists found a powerful metaphor for explaining the imperial crisis. Here are just three examples from an almost limitless supply: In 1774, the First Continental Congress condemned more than a dozen acts of King or Parliament and concluded that these “tyrannical” measures were evidence of “a system formed to enslave America.” The following year Virginia statesman Patrick Henry employed similar imagery in an impassioned address to the Virginia House of Burgesses. Most of us would recognize Henry’s emphatic conclusion—“Give me liberty or give me death!”—but moments earlier the silver-tongued orator had told his colleagues, “It is now too late to retire from the contest. There is no retreat but in chains and slavery.” A year later, when the Revolutionary War was well under way and going poorly, the famous pamphleteer Thomas Paine exhorted patriots to persevere in these “times that try men’s souls.” If they chose the path of submission, Paine warned, then “slavery without hope” awaited them. Slavery was a powerful metaphor because the colonists could relate to it. They could relate to it because it permeated their world. By the 1760s the kind of slavery we remember was largely limited to the colonies from Maryland south. In those colonies (Maryland, Virginia, North and South Carolina, and Georgia), Africans and the descendents of Africans comprised roughly two-fifths of the population, and almost all of them labored as slaves for life, the property of white masters who had a legal claim both to them and their offspring. In the tobacco and rice fields of the southern colonies, they worked from dawn to dusk producing the staple crops that made Britain’s North American colonies so valuable to the Empire. In contrast, by the eve of the Revolution black slaves were scarcely 2 percent of the population in the northern colonies. But this was not the only kind of “slavery” prevalent in the colonial world. 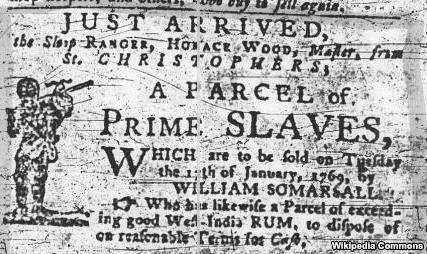 Long before African slavery loomed large in the colonial economy, white Englishmen like Richard Frethorne were toiling on American plantations as indentured servants. In theory, indentured servants forfeited their freedom for a period of years (typically between four and seven) in exchange for some sort of remuneration. (Most commonly, they labored to repay the costs of their transportation from Europe to North America.) Indentured servitude differed from slavery in two crucial respects: its duration was finite—adult indentured servants rarely owed more than seven years’ service—and it was not hereditary. As important as these differences were, this much must be understood: indentured servants were not free. 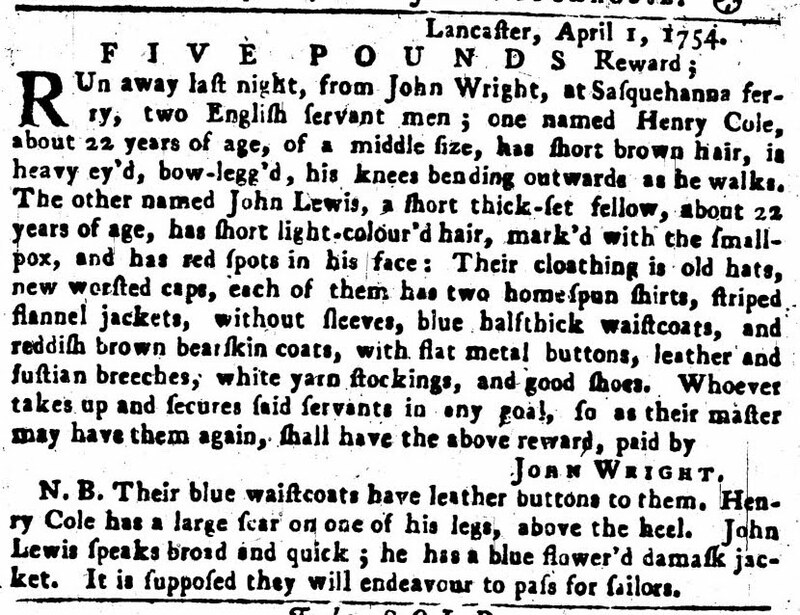 This ad for a runaway servant appeared in the Pennsylvania Gazette in April 1754. 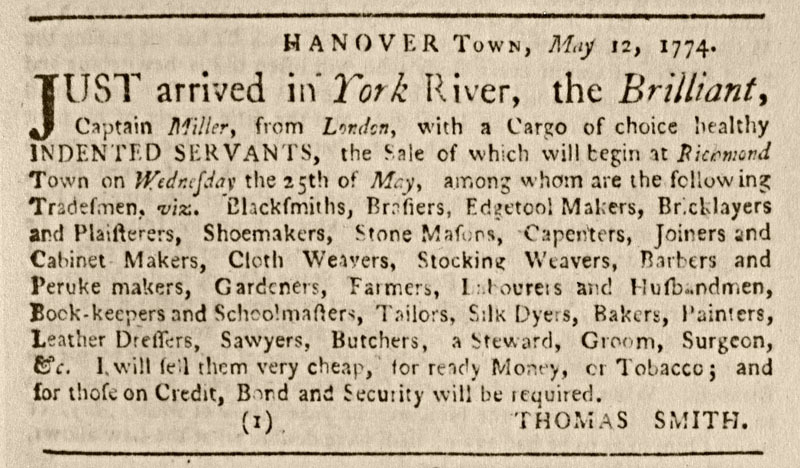 The sale of human beings in the market on board the ship is carried on thus: Every day Englishmen, Dutchmen and High-German people come from the city of Philadelphia and other places, in part from a great distance, say 20, 30, or 40 hours away, and go on board the newly arrived ship that has brought and offers for sale passengers from Europe, and select among the healthy persons such as they deem suitable for their business, and bargain with them how long they will serve for their passage-money, which most of them are still in debt for. When they have come to an agreement, it happens that adult persons bind themselves in writing to serve 3, 4, 5 or 6 years for the amount due by them, according to their age and strength. But very young people, from 10 to 15 years, must serve till they are 21 years old. When we combine the number of slaves and indentured servants in colonial America, it is no exaggeration to conclude that the “peopling” of Britain’s North American colonies centered primarily on the unfree, both black and white. 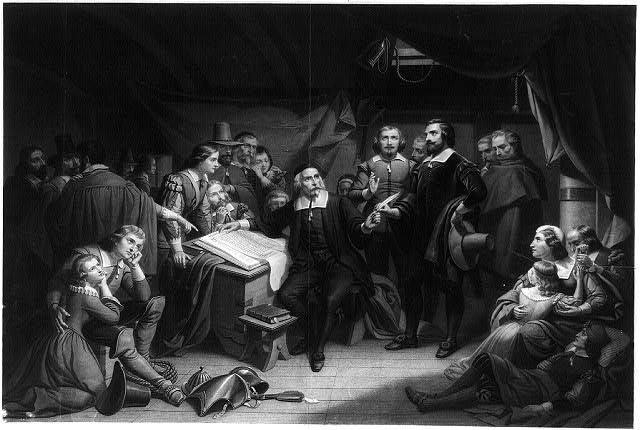 Between 1607, the year when the first permanent English settlement in North America was established at Jamestown, and 1775, when the first shots of the Revolutionary War rang out on Lexington Green, nearly three quarters of a million individuals came, willingly or unwillingly, to America’s shores (not counting convicts). Of these, 311,600 were African slaves; 200,200 were indentured servants; and 217,900 were free men, women, and children. In percentage terms, nearly 43 percent of the total came as slaves and 27 percent came as indentured servants. Only three in ten immigrants to the future United States arrived as free individuals. So what are we to make of this? I’d be interested in hearing what you think. Let’s return to the American Revolution. In a previous post on my American Revolution course at Wheaton College, I explained that I never begin a course by immediately diving into the subject matter. I like to think out loud with my students about what we are going to be doing, and why it might be important to us. We start with a series of foundational questions that it’s good to revisit regularly: What is history? What does it mean to think historically? Why study history at all? These are basic questions, but far from simple. We then turn to the even harder question of what we might have to gain from a disciplined engagement with the past. One of my favorite quotes in this regard comes from the former Archbishop of Canterbury, Rowan Williams, who challenges us to believe that “there will always be gifts to be received from the past.” To be educated is to be transformed, and I want my students to be open to the possibility of transforming knowledge. After devoting two full weeks to these building blocks, we finally turn to content, but not exactly to the content I think my students are expecting. The second section of the course is entitled “Setting the Stage,” and it is meant to embody one of the most fundamental axioms of historical thinking, namely, the crucial importance of context. Historical context is crucial to historical understanding for one basic reason: none of us lives in a vacuum. Waxing poetic, historians sometimes liken human history to an enormous, seamless tapestry. (Imagine the wall of a European castle here.) Although it is possible to extract and examine a single thread, it is in contemplating the larger pattern that we can best understand the purpose and significance of the individual fibers. In sum, the particular makes little sense without reference to a larger whole. Similarly, when wrenched from its historical context, an isolated historical fact may intrigue or entertain us (good for crossword puzzles or Jeopardy), but it has nothing meaningful to teach us. No context, no meaning. It’s that simple. So if we want to understand the causes and meaning of the Revolution to American colonists, we want to place the events that get into the textbooks—the Boston Massacre, the Tea Party, the shots fired on Lexington Green—into the larger fabric of their lives. To understand what these events meant to colonists, we need to know more about how they looked at the world. Candidly, many of the popular writers who get caught up in debates about the American founding don’t take the time to do this, and their understanding suffers. Among other things, serious engagement with the past requires time, patience, and a willingness to postpone judgment while we try to make sense of what we encounter. As we search for understanding, we’ll need to grapple with context in two dimensions. We will want to know what was going on at the same time as the highly publicized political events that we tend to remember. We will also need to investigate what had gone on before those events—maybe even long before. To illustrate the former, I ask my students to read a chapter from a much acclaimed academic work published during the bicentennial of the Revolution, The Minuteman and Their World, by Robert A. Gross. The author’s goal was to understand the patriots who fought with British soldiers at Concord, Massachusetts in April 1775, to transform them from two-dimensional “minutemen” into three-dimensional fathers and sons leading complex lives. He spent years of painstaking research aimed at recreating life in Concord, so that the exchange of shots at Concord Bridge would not be an isolated moment forever frozen in time, but an episode in the unfolding story of a living, changing community. Toward this end, Gross asked all kinds of questions that we might not automatically think are pertinent to understanding the origins of American independence: How did the townspeople earn their livings? What did their work involve? What did they eat and wear? What was the dynamic within the household and between generations? How long did they typically live in Concord? Where did they come from? Why did they leave and where did they go if they left? What did they read? What did they say in town meetings? What did they hear from the pulpit? Who served in the town militia? How were they affected by events outside of Concord? The list goes on. But understanding the world of Concord also required Gross to delve deeply into Concord’s past prior to 1775. How could he fathom the significance of the patterns he discovered if he had no sense of how they related to the arc of change and continuity across generations? Humanly speaking, our lives are influenced (not determined, but profoundly influenced) by what has gone before us. Indeed, if there is a single truth that inspires the serious study of history, it is the conviction that we gain great insight into the human condition by situating the lives of men and women in the larger flow of human experience over time. 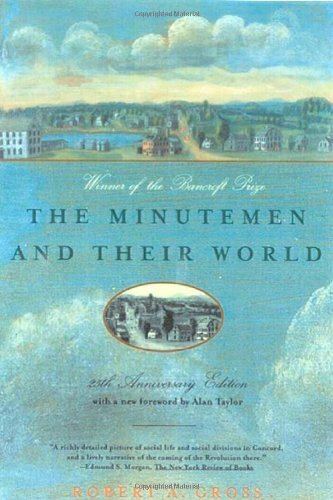 The Minutemen and Their World was republished in 2001 in a twenty-fifth anniversary edition. It came with a new set of fascinating reflections by the author, who explained his fascination with the Revolution as well as how his understanding had evolved in the intervening quarter of a century. This edition is still in print, and it is well worth your time. If you decide to read Minutemen, however, don’t fall into the trap of assuming that Concord was somehow a microcosm of the thirteen colonies, which it definitely wasn’t. With that caution, Gross’s book is a masterful example of a historian’s attention to context and a marvelous illustration of why context is essential to understanding.